The NHF portion of the ‘Woman Behind the Camera’ project, spans almost a hundred years of black and white, color, sound, and silent film. Some, like the Kodak films with their edge codes, give a clear idea of the time period. Though edge codes cannot establish when the images were shot, it does let us know when the film itself was created. Other film formats, though less precise, can still give an idea of the time period by looking at the materials used, the coloration of the film, etc. To determine when a film was actually shot, we generally rely on the information provided by the donor. This can take the form of can labels, notes donated along with the film, and, if we are lucky, interviews with the films creator. If none of those resources are available, we have to rely on the information within the films themselves. Landmarks, clothing styles, automobile makes, and references to historical events, all help to determine the time period when a film was shot. Emma Louise Cole, the mother of Zelma Williams and the creator of several of the early films in the Zelma Williams Collection, filmed scenes around the family home on Nantucket Island. 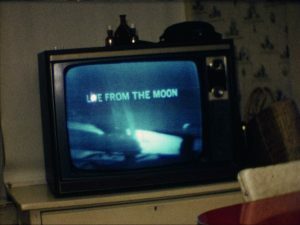 In between lighthouses and children playing in the backyard, we get a shot of the television: ‘Live from the Moon’ flashes across the screen, as an astronaut takes those world shaking first steps. And so we know the date of the film: July 20, 1969. Zelma Williams, in a style similar to her mother, continued the tradition of training the camera on their family, both at home and on vacation. 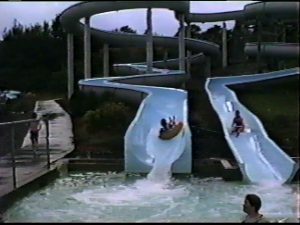 At an outing to a water park for a child’s birthday party, a line of children stream past the camera, grab inner tubes, and head back up the stairs, climbing the tower to ride a water slide back down. It looks like an idyllic summer day. Over the shouts of children, unseen but heard, a radio blasts the news. Akbar Hashemi Rafsanjani has just been sworn in as the President of Iran, and so we know the date is August 1989. Sometimes the time period is generalized. Fast forward a few years and the children from the water park are now teenagers, skateboarding on the pier, where everything from their clothes to the slang they use is all early 90s. 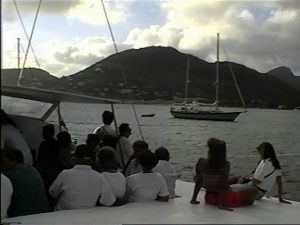 On a family trip to the island of St. Martin, a tour boat captain unabashedly blasts Vanilla Ice’s ‘Ice Ice Baby’. At other times the date is more precise, like the moon landing. At one point, as Zelma’s daughter watches television, an announcer declares the 106th Rose Parade, held on January 2, 1995. But what about the films without sound or convenient shots of the TV screen? Other background images also help with establishing time and place. License plates, caught as a relative pulls out of the driveway, waving goodbye, are often a reliable source of dates. So are make and model of the cars they are attached to. Other background images can give hints to the time period and world events. At one point in Charles Reid’s documenting of his bicycle trip around the United Kingdom, he stops to pose in London’s Trafalgar Square. A sign calling for men to enroll in national service can be seen at the base of Nelson’s Column can be seen. Several collections feature scenes shot at World’s Fairs and Expos in San Francisco, New York and Montreal, many of which were open for at least a year, if not longer. 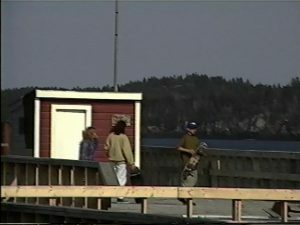 The amateur films and home movies contained in the NHF portion of the ‘Woman Behind the Camera’ project give a unique, candid look at their creators lives. Many collection allow the viewer to see, in short 10 to 20 minute segments, decades pass and entire generations of families grow up. It is a very personal view of the passage of time. But in the background noise, the wider world creeps in.